Spatika – Beyond Doubt & Illusion, is an inward journey to instill the light of awakening before “the transmigration” of the Soul. Spatika is a transparent stone that allows light to pass through without restraining any bit of it and it is this pristine quality that the soul strives to imbibe in its journey. Man, with his limited intelligence is beset with doubts. Conflict and Clarity tip the balance. There is an inner urge to commune with Spatika - the symbol of clarity. Which is right ? Is there light ? What is my choice ? The concept, composition, rhythmic–soundscape and direction is by K.S.R. Anirudha. Western musical sections composed and performed by Pradeep Krishnan. 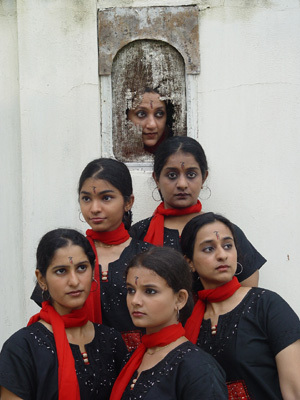 The step-design and performance includes Chennai-based classical dancers Priya Murle, Padma S. Raghavan, Priya S. Dixit, Prabha S. Dixit, N. Sashireka, Smrithi Jayasundar, T.M. Sridevi, Suchitra Ramaswamy and K.S.R. Anirudha. What sort of music have you scored for Spatika? Is it classical or a kind of fusion? The soundscape uses the depth of Carnatic music, the lilting tunes and traditional recitations of folk and the flamboyant spirit of new age music. The individual identity and classicism of each style is maintained throughout. On what have you given the most stress…on melody or rhythm? And why? Shree Bharatalaya is known for its traditional dance style. What inspired you to break away and do a contemporary work? Firstly, this is not a Shree Bharatalaya production. It is my humble attempt with dancers of Shree Bharatalaya. I think it is not difficult for professional dancers grounded in a classical art form, who are exposed to different styles of dance, to experiment like this. We haven't still 'broken-away', this is just another form of expression. How challenging has it been to venture into experimental work? Have you done any other experimental work before, or is this the first one? It has not really been very arduous as I personally have worked with Anita Ratnam and that has helped me to think contemporaneous. Of course, I only composed certain pieces of the soundscape for Ratnam, but this is our debut as an individual work. Fortunately for me, all the dancers of Shree Bharatalaya have been exposed to modern dancing (Martha Graham technique) and calisthenics, which was learnt by guru Sudharani Raghupathy from Jose Limon (Randolph Macon's Women’s College, Virginia, USA-1965). The students have also undergone routines and master classes in the aforesaid. Who has choreographed Spatika? Or is it a group effort? What type of movements have you used? The choreography is a group effort, wherein I have conceived the idea and directed them. Vibrant movements of classical Bharatanatyam, the inner strength of tai-chi, the suppleness of kalari and yoga together with the Graham technique have been combined to present this palate. Do you intend to present Spatika during the Chennai December season? Of course, apart from the 6th of Dec. at The Other Festival, I look forward to at least two more stagings of Spatika during the season and the organizers whom I've approached seem positive. Do you think your work will go down well with the Chennai audience who are too used to seeing you do traditional Bharatanatyam? The composition of audience matters when we make the above statement. Those who are more informed and look forward to experimental work are the ones who compose the audience for these presentations and I’m sure they'll like it.